Hello there, today I have another card to share that I made for the Clearly Besotted November teasers but was unable to share at the time. Today I am using the super cute Petite Plushies stamp set. I started off by cutting a piece of white cardstock suing a SSS Stitched Rectangle die. 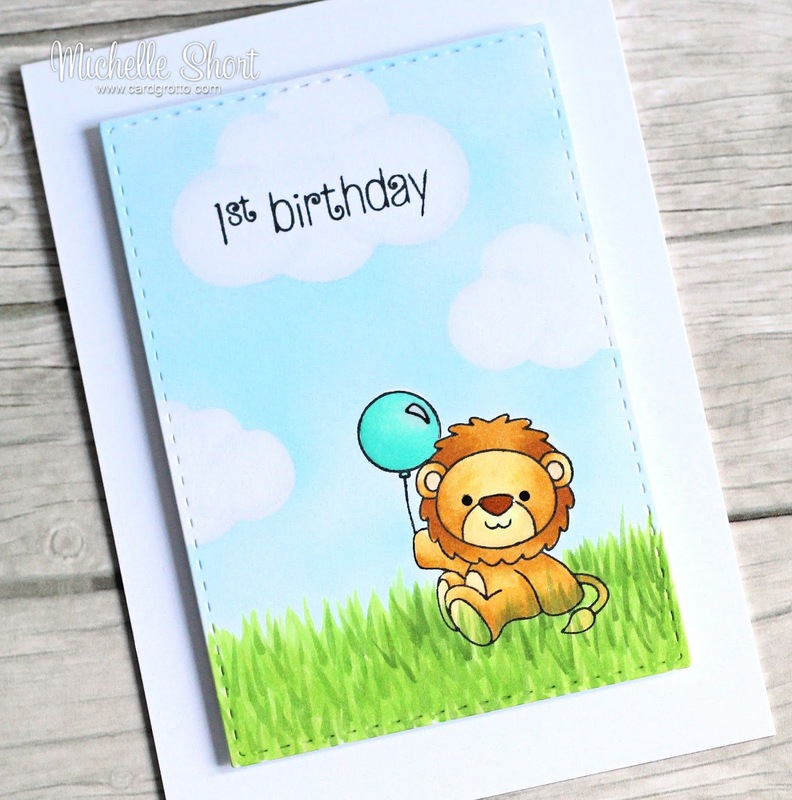 I then stamped the lion and the balloon from the set. These were then masked off along with some clouds (I cut masking paper using the Sky's The Limit cloud dies). I then used my Copic Airbrush to add in the sky. The masks were taken off and then I coloured the panel using Copic Markers. The sentiment, from the same set, was stamped in the top cloud. I finished off by adding Glossy Accents to the Lion's nose and balloon. The panel was added to a white 4 bar notecard using foam tape. COPIC MARKERS - Lion: E99, YR24, YR23, YR20, Y23, Y11. Balloon: BG23, BG13, BG11. Grass: YG67, YG17, YG23, YG03. Sky: B00, B000. Clouds: C00, C0. I thought this would make a nice gift card holder or money card. Thank you so much for visiting me today. I hope you have a great week. 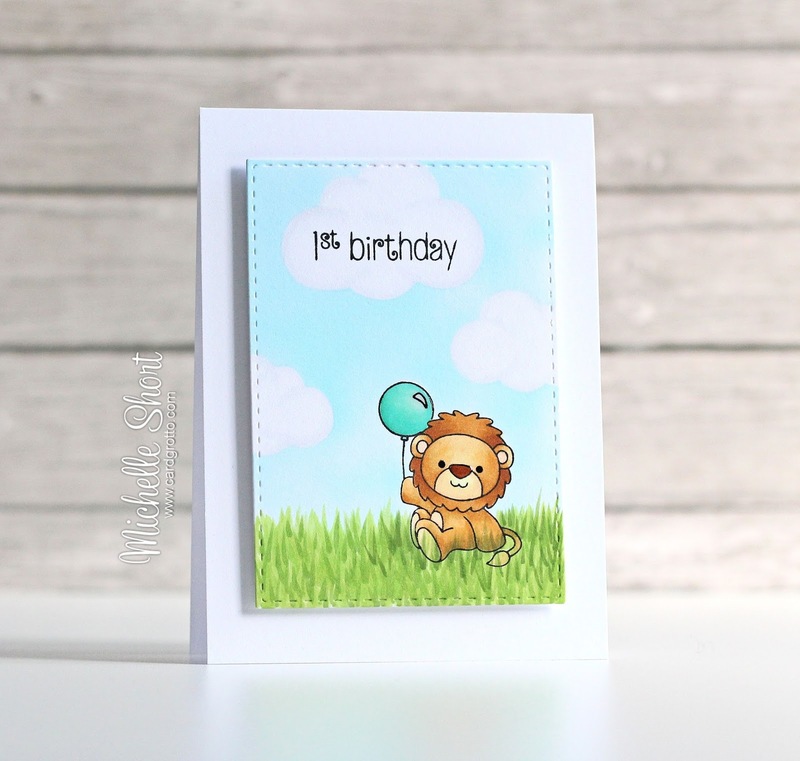 Michelle, your card is just so adorable with this sweet image! Great colouring and a very cute card! Hope you are a lot better today. Such a cute card, love the way you've done the sky & grass!